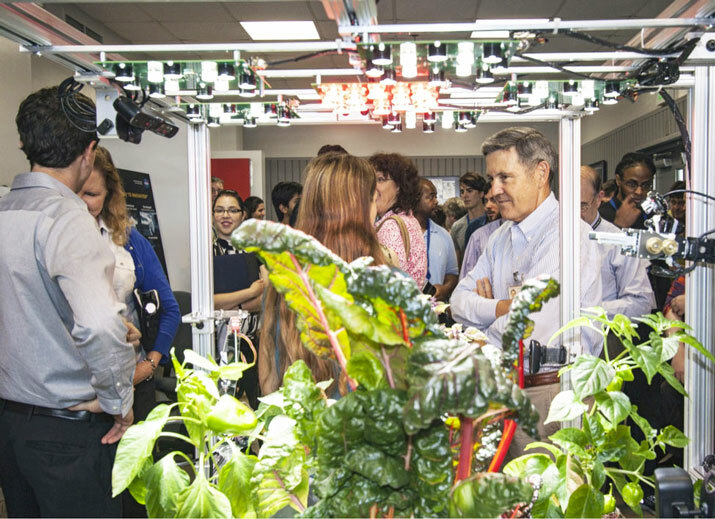 University of Colorado’s robotic plant growth is demonstrated at the Kennedy Space Center. Source: NASA. Targeting a sustainable presence of humans in outer space will require solving air, water, energy, and food supplies within a few thousand cubic feet surrounded by vacuum. What seems at first sight to be a problem of an apocalyptic, remote future reveals itself as the grand challenges of our civilization in a nutshell. This article argues that space exploration can be one of the main drivers to revolutionize sustainable agriculture on earth. First, the agricultural industry has classically not been the driver, but on the receiving end of innovation in automation. Current economic drivers promote increasing the size of farm equipment and mono-cultures, which are more suitable to automation. Thinking about solving food production on a space-ship, Mars-colony or city-scale, which have opposite requirements than industrial agriculture, makes it clear that solutions will not come from incremental changes to the current system, but require a disruptive approach that has very little to do with current agricultural practice. Second, sustainable agriculture is a systems challenge that does not stop at innovation in automation, but also requires advances in renewable energies and integration into water and air management to be successful, in particular when considering integration of agricultural production into urban environments. Third, advanced life support systems are not only mission-critical for long-term exploration missions, but the National Aeronautics and Space Administration’s (NASA) support strongly hinges on the perceived value of its mission; using space exploration as a driver to solve our most pressing grand challenges is a strong narrative to gain public support. Since the advent of agriculture around 12,000 years ago, humans have developed a highly sophisticated system for global food production with the most rapid technological advances occurring during the first half of last century. In the 1920s, agriculture had not only adopted new machinery, but also the financial, cultural, and ideological apparatus of industrialism. This process has led to farm equipment of ever-increasing size, modern plant breeding programs, the use of synthetic fertilizers, delivery of water via irrigation systems, and the use of pesticides to control crop herbivory, which have all contributed to a tremendous increases in crop yield. For example, corn yields in the US increased approximately 400%-500% from 1940 to 1997. Together with consolidation of small farms into larger ones, the number of people that a single farmer in the US provides for increased 9-fold from 15.5 people per farm in 1950 to 140 people per farm in 1997. While providing immense cultural benefits, these developments came at tremendous environmental costs. Increased fertilization has led to excess nitrogen and phosphorus in the water systems impacting both human health and the integrity of aquatic ecosystem, and also to increases in nitrous oxide production (a potent greenhouse gas). More recently, there is also an increasing awareness that the global supply of phosphorus, which is a non-renewable resource but an essential plant nutrient contained in most synthetic fertilizers, is expected to peak mid-century and decline thereafter. Also, cultivation of just a few crops (corn, soybeans, hay and wheat make up 68% of farm land in the US) in ever-increasing monocultures and the resulting lack of plant diversity make these systems vulnerable to large-scale pest outbreaks. Finally, the high specialization on certain crops in different parts of the US – which is the result of industrial streamlining the process – requires considerable transportation cost, and might become infeasible with increasing cost of oil. Taken together, there is a critical need to develop agricultural practices that deliver water and nutrients in a manner that minimizes losses from these systems, while creating an ecologically resilient agricultural system that can withstand or quickly recover from disturbances such as pest outbreaks, for example by using companion plants and poly-cultures. 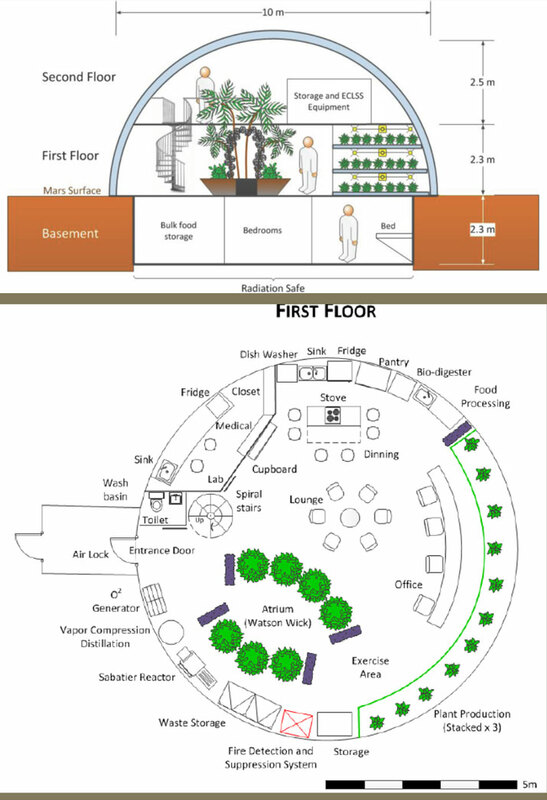 Figure 1: Artist impression of an indoor precision agriculture system that is co-located with people. Artwork by Nick Dragotta. Advances in robotics can decrease detrimental effects of farming by precise administration of water and nutrients and inter-cropping, while bringing agriculture closer to consumers. Besides being able to provide individual plants with the required resources on an as-need basis, small-scale robotic platforms are not limited to operating on fields, but could also reclaim urban environments that are currently deprived from agriculture and horticulture, such as within offices, shopping malls or on roofs. A concept drawing of a team of robots cultivating plants in a shopping mall is shown in Figure 1. It is worth noting that neither agriculture nor horticulture have ever been the main drivers for innovation in automation. Rather, industrial methods and techniques were adapted to agriculture long after they have proven successful in other trades. This trend seems to be persistent still today. For example, automation in agriculture is enabled exclusively by the availability of small-scale and cheap computation, which has been driven by the electronic spread-sheet. Similarly, disruptive actuation and sensing technologies that have the potential to bring agricultural automation to a new level are being developed in orthogonal markets, such as the gaming industry, manufacturing, or construction. Indeed, major industrial players in precision agriculture support their technical innovations by developing for the construction industry, e.g., large earth moving equipment, which provides higher margins than agriculture or horticulture. Based on this history and lack of economical drivers that will require industry to leap from large-scale automation to urban-scale precision agriculture, I argue that truly disruptive innovation is more likely to be developed for niche applications, such as space exploration. Going to Mars is in the tradition of setting foot on the moon, exploring the West, and ultimately the very exploration that led to the discovery of America. All these missions have in common that they are variants of the “knapsack problem”. Explorers need to decide on a combination of provisions and tools that allow them to maximize exploration and minimize risk of failure. Parameters of this problem are the set of brought-along goods, available resources harvested on the way, and the constraints of vessel size. Larger vessels allow more goods to be brought along, but also require larger crews to maintain them, again requiring more resources. A space mission adds an additional complication as the launch mass is limited by the amount of fuel. The larger the rocket, the more fuel is needed, in turn requiring more propulsion to increase launch mass. This optimization problem currently limits how long we can sustain ourselves in space and therefore where we can go and what we can do there. While advances in agricultural practices and transportation systems have solved this problem for humans who have now permanently settled earth’s most remote spots, this approach is about to reach its limitations on earth and does not extend to space. Considering the vast emptiness of space (and the scarcity of resources on other planets), solutions to this problem will require us to make better use of resources found in place, and to think about how to recycle them. For example, food can be grown and fertilized from “black water” and help to turn toxic carbon dioxide into carbon – to remain in the plant – and oxygen. While maintaining a fully enclosed ecosystem that is significantly smaller than our own planet and can support human beings has not been accomplished yet, doing the math on launch mass and potential yield has shown that growing food in space becomes advantageous for missions exceeding two years in space. For missions shorter than that, the additional launch mass and space of the tools and provisions that plants require is better used by bringing additional resources. An alternative scenario is to launch life support systems to arrive before humans do (Figure 2). In both cases, automation is necessary as the use of humans to perform these tasks is highly inefficient in a space scenario. A major payload driver for autonomous food production is the additional required water resources. Yet, after reaching a critical mass, plants are an excellent natural system for converting black water into drinking water. Hereby, plants consume the water via their roots and return purified water into the local atmosphere via evaporation. Although small-scale systems to replace waste-water treatment plants in remote areas have been successfully demonstrated, additional research is needed to implement such systems in a self-contained, easy to maintain, fashion. Future long-term space exploration missions are likely to depend on a combination of bio-chemical processing and biological filtration, requiring a systems view and increased understanding of the micro-biology of the underlying processes. Although other planets provide massive reservoirs of frozen water in their pole caps and under their surface, water shortage has become a major problem in the US west of the continental divide and large areas of the world are subject to desertification, making water shortage a global problem, and requiring drastic increase and decentralization of processing. While water shortage for now mainly affects our quality of life, water conflicts have been linked to the Rwandan genocide and the war in Sudanese Darfur. Plants also have the capability to absorb carbon from the air and releasing oxygen. On earth, this task is to a large part accomplished by tropical rain forests, which are responsible for roughly a third of the earth’s oxygen turnover. For space exploration, plants alone are not sufficient, requiring machines to scrub carbon dioxide from the atmosphere. While regenerative carbon dioxide scrubbers – a process mainly requiring electricity – have been in use on the now decommissioned space shuttle, terrestrial applications include carbon dioxide reduction of power plant exhausts. Albeit feasible, current technology is not cost-efficient to deploy and to operate, mainly due to the lack of economical drivers. This research would be desirable, however, as carbon dioxide emissions are believed to be the main driver behind man-made global warming, with its long-term effects yet to come. Lighting for food production and photosynthesis, water purification, and carbon dioxide scrubbing will require additional energy, further driving the required launch mass of an exploration vessel or station equipment. Energy is available in effectively unlimited quantities from the sun, but requires efficient conversion. On earth, solar power is also an attractive alternative energy source for earth-based applications and could drastically reduce our dependency of fossil fuels, which are both a source of international conflicts and carbon dioxide emissions. Current solar cell technology is not yet competitive with electricity generated from fossil fuels and nuclear power, requiring additional research into reducing production cost while enhancing efficiency. A space mission could be a significant driver for the latter without being limited by the economical drivers of fossil fuels that dominate next-generation solar cells that industry deems economically viable. Space exploration has historically been a geo-political, strategic instrument. Showing the ability to precisely place an object into lower earth orbit or onto the moon demonstrates the capability to project power at long distance with high accuracy. In addition to leading to game-changing military capabilities, space exploration has transformed life on earth. Sputnik, the first radio satellite, led the way to worldwide telecommunication and global positioning. Sputnik also spurred a space race, leading to launch systems of increasing size and precision, eventually culminating into the Apollo program, the first human on the moon and the strategic defense initiative (SDI), also known as “Star Wars”. Albeit the collateral science and engineering benefits of these missions are beyond doubt, they became increasingly less tangible. NASA has recovered from this by focusing its missions on atmospheric sensing, revolutionizing the fields of geology, agriculture, archeology and many others, and space exploration leading to jaw-dropping and deeply inspiring photographs of outer space that have fundamentally changed our understanding of the universe and our role therein. Nevertheless, the cost of these missions seems to less and less justify their benefits. With the industrialized nations accumulating prodigious amounts of debt and the developing countries fighting over water and food, understanding the origins of our universe and setting foot on other worlds becomes more and more a secondary goal in public perception. NASA is currently rallying interest for a “planetary defense” mission with the goal of robotically bringing asteroids into a near-earth orbit where they can be used as a shield to deflect asteroids such as the one grounded in Russia in the spring of 2013. Albeit such a mission supports the geo-political narrative of the US as global guardian and would lay the technical foundation for a paradigm shift from earth-launched to space-launched exploration, the actual risk of an apocalyptic asteroid impact is minuscule compared to risks arising from political instability and resource problems elsewhere in the world. Therefore, it is unlikely that such a mission can inspire the same national energy that the space race did, and which is imperative for the success of a manned mission to Mars. Instead of motivating space exploration with geopolitical advantages and science outcomes that are inaccessible, or even moot, to the general public, I argue to identify missions whose success is aligned to solve mankind’s greatest challenges: food, energy, water and air. Figure 3: Remote-operated greenhouse with self-contained light and water supply (left). With growing food in space not on the critical path of missions immediately ahead, but a long-term requirement, research in space-based agriculture should focus on the following three fronts: increasing our knowledge of in-space plant growth, solving the key perception and manipulation challenges of plant maintenance, and understanding the impact that observing, maintaining and eating plants has on humans in the isolation of space. These three thrusts are closely inter-related and can benefit from automation. Indeed, plant growth experiments are recurrently undertaken on the ISS and could tremendously benefit from automation. 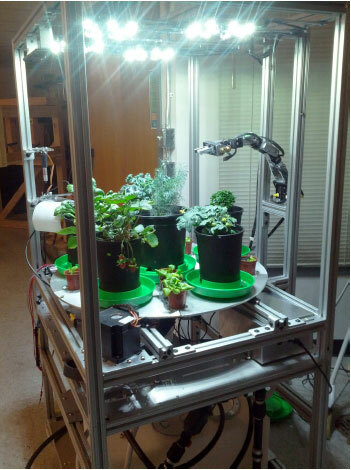 For example, light-weight, low-energy robotic arms could enable scientist to systematically sense within the plants’ canopy, and automated management of air, water, and nutrients on a per-plant basis would allow us to better understand how the space environment affects these parameters. As fully autonomous plant maintenance requires solutions to a series of hard problems in perception and manipulation, initial focus should be on remote operation of the growing process (Figure 3, left). Devising a system that solves all the mechanical, user interface and communication challenges that would allow to grow plants (from seeding to harvest and re-planting) can serve as the basis for further developing automation and could motivate its own mission such as deploying a greenhouse container to Moon or Mars. Figure 4: The “Data Garden”, a gantry system to collect the data basis for autonomous plant operations (left). 3D point clouds, which can be the basis for remote-operation planning (right). Concerning human-factors, there is strong evidence that humans living in the isolation of space will drastically benefit from interactions, including taking care of, harvesting and eating, of plants. Active research challenges here are how to design this experience to be most beneficial for the astronauts. This includes not only identifying care-taking tasks that the astronauts actually enjoy, but also providing solutions to automating those tasks that are undesirable or induce additional stress. In the long run, remote operation will be more and more subsumed by actual autonomy. Here, key challenges are automatic assessment of plant status, manipulation of soft, flexible objects, and dealing with adverse environmental conditions such as mud, water and unpredictable growth that can quickly jeopardize a running system. Our agricultural system is about to reach its limitations, with demand for its products to outpace availability of resources. Space exploration is concerned with similar challenges, albeit at an extreme scale: water, energy, and air need to be turned into food in a nutshell in a most sustainable way that minimizes the influx of external resources. While industrial agriculture addresses its challenges by ever-increasing monocultures that are economical to automate, the needs of future urban centers on earth and colonies in outer space require an opposite approach: small-scale precision agriculture that provides care to plants on an as-need basis and that can integrate with water purification and air revitalization needs of its consumers. As the technological leap this approach requires is gigantic, it is unlikely to be performed by the agricultural industry, whose economics exclusively support incremental changes. This is not the case for space exploration, which can – given strong public support of its mission – support disruptive technological advances such as sending a man to the moon and eventually allow us for sustainable existence on other planets. This is a challenge that dwarfs sustainable living on earth.